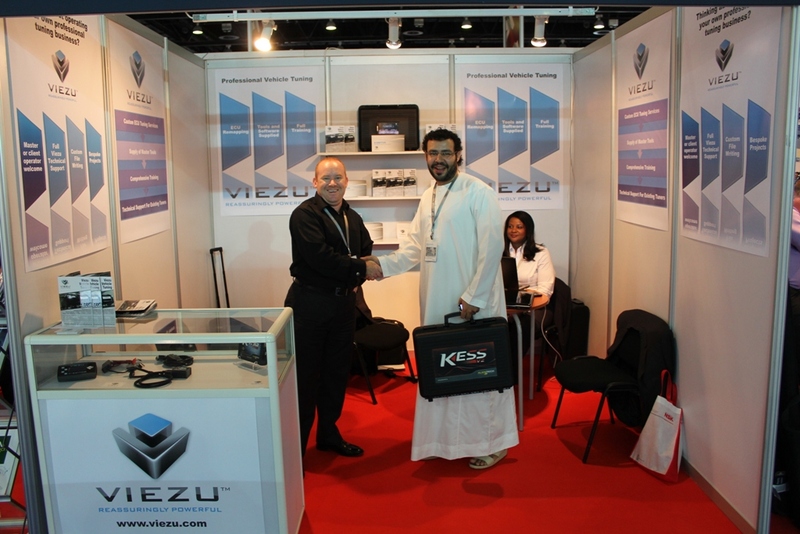 Viezu had a great week at the Dubai Automechanika show this week, we met lots of old friends and found some new ones too. The Dubai car tuning scene is fast paced, and focuses purely on gasoline performance tuning and ecu remapping. The Automechanika show is the leading car tuning and performance car show in the Middle East and Viezu were very pleased to be there again. Viezu already have a strong worldwide dealer network offering tuning and ecu remapping, the show gave us the opportunity to meet our dealers, customers and new training partners too. Due to the extensive Japanese vehicle market in the Middle East we took the new K-tag and J- tag tuning system, capable of tuning most European vehicles including anti tune and late model edc17 + ecus, previously locked for tuning. But also very importantly for the Middle Eastern cat tuning market a significant range of Japanese petrol vehicles, including Nissan, Mazda, Subaru, Mitsubishi, and Honda tuning.